A mom’s life was saved by giving birth, as it helped doctors detect a cancerous mass. 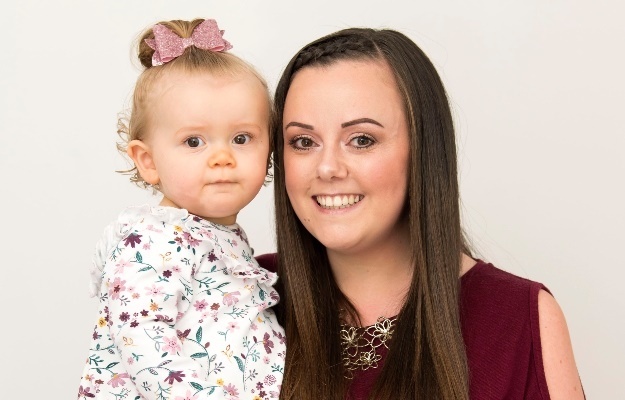 Carla Woods (29), from Wales in the UK, was diagnosed with cervical cancer after midwives spotted a lump on her vaginal wall while she was birthing her youngest daughter, Freya, now 14 months old. The mom of two had no other symptoms and believes her daughter saved her life. Carla’s cervical cancer had spread to two lymph nodes in her groin and she needed intense chemotherapy, radiotherapy and Brachytherapy in a bid to survive. Thankfully, Carla was told in January this year she’s now cancer-free. She’s sharing her story to highlight the importance of Pap-smear tests. “I call Freya our little miracle baby as without her I wouldn’t have been diagnosed with cancer until it had spread further,” she says. “At first the midwife thought it was a fibroid when she spotted the mass and they told me to book a doctor’s appointment for further tests. The tumour was already the size of a satsuma and Carla needed chemotherapy and radiotherapy to get rid of it. Carla, herself a healthcare advisor, had never missed a cervical smear test before falling pregnant. Despite always having clear results prior to her diagnosis, she’s now urging other women to not push aside the lifesaving test. “I didn’t have any of the usual symptoms that are typical of cervical cancer, such as bleeding or back or pelvic pain. So, if I hadn’t given birth when I did, the tumour would have continued to grow – which is why I’m so thankful to Freya. Though Carla won’t be having any more children as the aggressive treatment has caused her to be in early menopause, she says she’s just happy to be alive and cancer-free to raise her two kids.